← Wanna be successful? Go Gaga! Are you sure? I mean, are you Positive? Since we’re very often surrounded with negativity, it’s easy to start your day in a bad mood. I heard Earl Schoaff say (paraphrased) that what most people do is this: first thing in the morning they get the newspaper or watch the news on TV and feed all the negativity going on in the world directly into their minds. I think it’s safe to say that after hearing about famine, wars, fatalities, divorce, crime, accidents, corruption, disasters and illnesses that our mood can change quite drastically. All of that “bad” news can be pretty depressing and discouraging couldn’t it? Now, I’m not talking about avoiding someone when real tragedy strikes, that’s not what this is about. I’m talking about how easily your day can become one that’s filled with gossip or negativity, which will either sadden you, bring you down, burst your bubble or leave you feeling defeated. In the computer field they call it “garbage in, garbage out.” It means that whatever you feed into the computer, is what will come back out. Being that our brain is a computer wouldn’t it make sense to be aware of what we feed into it? I personally don’t read the paper or watch the news because what goes into my brain is critical to my happiness, health, well being and success. I also try to surround myself with positive people, places and things. 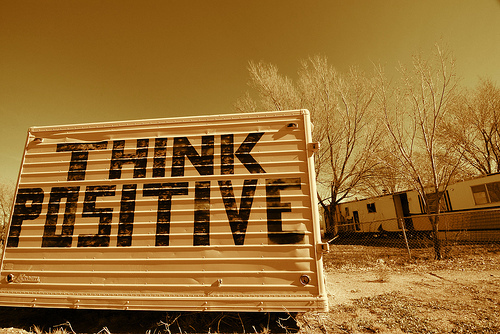 You should know that negative thinking is contrary to our birth rite. We’re born thinking that there are no limits to what we can accomplish. When we were young if we wanted to be a fireman, the president or even a cowboy, we THOUGHT that we could. Okay, that’s from the male perspective but the point is that we used to think that we could do anything. The sky was the limit. Until either we imposed new limits upon ourselves, or we started to believe it when others told us what we can or cannot do. Can we reverse this? Yes! You have control, it’s your life. Start off on a positive note and stay there. Do not let anyone derail you, they usually do not have your best interest in mind, they simply need to keep you down because you can share their grief or disappointment and then you feel worse and they feel better. Again, I’m not talking about something truly tragic here. Read something positive. It can be the bible or a motivational quote, as long as it’s empowering. Reflect on things that you are grateful for. Make no excuses, you can find them. Avoid the pity party. You don’t have to engage in this behavior or activity. Do something for someone else in a selfless manner. Dream again. Find those things that inspire you, the dream home, the new electronic gadget, whatever it is, get a picture of it and feel it as if it’s yours. Give out positive energy. Encourage someone. Praise someone. Smile. This alone is powerful. If you try, you CAN find something to smile about. Reflect back on a euphoric moment so you can relive that moment of happiness. Laugh. Still the best medicine. Love. Hug someone, tell someone that you love them. Forgive. Truly forgive. Both yourself and others. This can remove a weight of negative emotions, thoughts and feelings. You might not be able to reverse things overnight but If you start to do this you’ll be amazed at what happens. You’ll attract not only positive people but also positive results. And eventually, the negative people won’t like you as much and they’ll begin to leave you alone, because you’re no longer fueling the negativity. You’ll be blacklisted from the pity party and you’ll move onto the VIP party. Is this easy? No. You need to have the desire, the perseverance and the nerve to become a positive person again. It’s all up to you! This entry was posted in Sales Training and tagged cold calling, customer sales, customer selling, direct sales, effective sales, goal setting, handling objections, marketing selling, motivation, rob liano, rock star sales trainer, sales, sales advice, sales coaching, sales consultant, sales consultants, sales effectiveness, sales funnel, sales management, sales manager, sales marketing training, sales objections, sales presentation, sales reps, sales selling, sales skills, sales team, sales techniques, sales training, selling, selling skills, selling techniques, selling training, strategic selling, vp sales. Bookmark the permalink. 4 Responses to Are you sure? I mean, are you Positive?